Catch Monstrox before he destroys Clay’s mech with his evil tech infection! Place Clay into his trusty battle suit, then pilot his mighty mech with its giant sword, shielded 6-stud rapid shooter and extra support from Merlok 2.0 at the rear. Chase Monstrox on his creepy critter legs, and stop InfectoByter and his CyberByter sidekick spreading their digital infection throughout the realm. 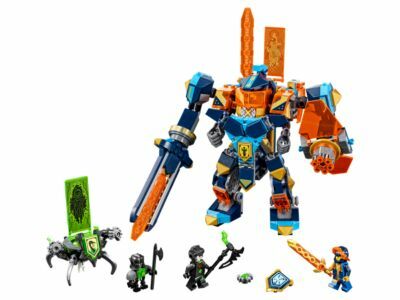 Includes 3 scannable shields for the NEXO Powers Whirlwind and Jungle Dragon, and Merlok Power The Sword of Merlok. The Tech Wizard Showdown (72004) Lego set is no longer directly available from the sites below. However, 3rd party partners of these sites might still have the set available. Alternate description Suit up for a Tech Wizard Showdown with Clay’s 3-in-1 mech! Includes 2 minifigures: Clay and InfectoByter, plus a CyberByter figure and Merlok 2.0 and Monstrox hologram figures. Clay’s mech features a minifigure cockpit, sword, shield with 6-stud rapid shooter, Combo NEXO POWER shield, plus a detachable Merlok 2.0 hologram figure attached to a flyer featuring a sword and a shield holder. Monstrox hologram's critter base features 4 posable legs and 2 critter shooters. Weapons include 2 buildable swords, Clay's sword, an axe and a scythe. Detach the Merlok flyer from Clay’s mech and attach it to Clay’s battle suit. Attach Monstrox to the back of Clay’s mech to inject the tech infection. Place the Merlok Power in a shield holder to upgrade your knight or vehicle in the battle against the bad guys! Scan shields for the NEXO Powers Whirlwind, Jungle Dragon and Merlok Power The Sword of Merlok, and power up in the LEGO® NEXO KNIGHTS™ game! Combine with the 72003 Berserker Bomber and place the Vyro Suit inside the mech’s cockpit, or place Clay's battle suit under the Berserker Bomber! Clay's mech stands over 9” (24cm) high. Clay's battle suit stands over 3” (9cm) tall. Merlok flyer with sword and shield measures over 3” (10cm) high, 4” (12cm) long and 2” (7cm) wide. Monstrox base measures over 3” (10cm) high, 2” (7cm) wide and 2” (6cm) deep.